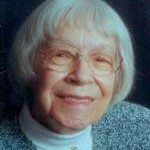 Edith Edna Young, wife of a Grace Brethren pastor and mother of longtime Grace Brethren Pastor Jerry Young, who died less than a month ago, passed away on Tuesday, January 4, 2011, at 9:30 p.m. at her residence on N. Bobwhite Drive, Warsaw, Indiana, at the age of 94. She was born March 5, 1916, in Topeka, Indiana, to William Lantz and Sarah Ann (Troyer) Lantz. She was married on April 21, 1934, to Reverend James Orville Young, who passed away in 1963. Edith moved to the Warsaw/Winona Lake area in 1965 and was a homemaker, seamstress, and worked as a Food Service Supervisor at Grace Village Retirement Community, Winona Lake, Indiana. She was a member of Leesburg Grace Brethren Church, Leesburg, Indiana. She will be lovingly remembered by her son: James (wife Carleen) Young (Grand Prairie, Texas); three daughters: Kay Young (Reno, Nevada); Edna (husband Robert) Wood (Warsaw, Indiana); Rebecca “Becky” (husband Joseph) Berger (Warsaw, Indiana); 17 grandchildren, 28 great-grandchildren, and 8 great-great-grandchildren. She was preceded in death by both parents, her husband, two sons, Dr. Stephen L. Young who died in 2007, Dr. Jerry Young who died in 2010, grandson James B. Young, two sisters, and two brothers. Visitation will be held Saturday, January 8, 2011, from 3-6 p.m. at Redpath-Fruth Funeral Home, 225 Argonne Road, Warsaw, Indiana. Funeral service will be conducted on Sunday, January 9, 2011, at 4 p.m. at Redpath-Fruth Funeral Home, Warsaw, Indiana officiated by Pastor Tim Sprankle and Reverend Jesse Deloe. Graveside services will be on Monday, January 10, 2011 at 1:00 p.m. at Rittman Cemetery, Rittman, Ohio. Memorial donations can be made in Edith’s memory to The Friends of Israel Gospel Ministry, Inc., PO Box 908, Bellmawr, New Jersey 08099. We are saddened by the death of Edith but happy she is with Jesus. We have missed her smiling face ever since we moved. Sorrry we are so far away but you all continue to be in our prayers. Thanks for the memories. We love and miss you all. So sorry to learn of the death of Edith. She had the sweetest spirit! I know that she loved the Lord and she will make Heaven that much richer. God's best to the family at this loss---so soon after the homegoing to Jerry.